Ace were turning out class acts of four-colour nastiness for several years and the fourth volume of Hand of Fate goes one step further with a bonus 1950 title in the shape of issue 1 of Challenge of the Unknown. And funksters, that's quite a shape! Artists include Lou Cameron, Sy Grudko, Richard Case, Jim McLaughlin, Ken Rice, Louis Zansky,Lin Streeter, Larry Woromay and Warren Kremer. 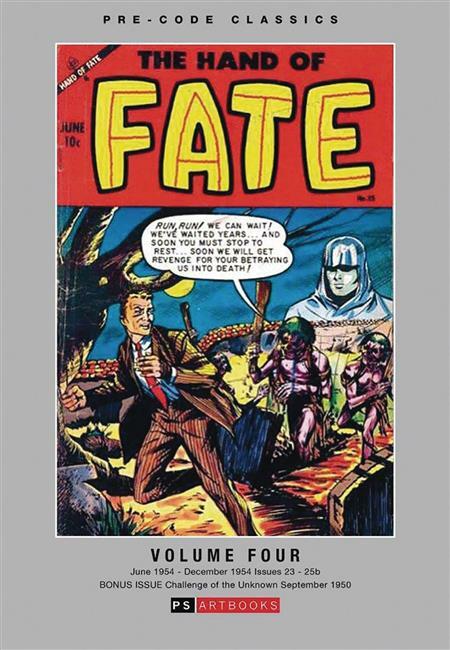 Collects Hand of Fate #23-25 (June 1954 to December 1954) and Challenge of the Unknown #1 (1952).